A question I often get is “How much investment should marketing make in advancing its capabilities?” It is a fair question. Many marketing budgets are limited and R&D type efforts are stymied by bandwidth challenges, so selecting the best strategic approach on marketing execution is crucial. One of the common ways to frame the question is through the Red Queen Effect theory. If you do nothing, you fall behind. If you run hard, you stay in place. Imagine for a moment about your current initiatives. You are motivated to at the very least to keep pace to remain relevant. According to a recent study by the CMO Council, 67% of marketers believe new marketing technologies are very important to overall marketing group performance and effectiveness. Yet, over half (56%) of companies still don’t have formal MarTech strategies in place. And only 16% say their MarTech strategies are well aligned with their business strategy. 27% of senior executives rate digital transformation as now being a ‘matter of survival’ according to MIT Sloan Management / Capgemini research. As an analytically driven marketer, you probably feel option 1 or option 2 above are simply not acceptable. 3. If you transform, you can move ahead. a) Visibility – Developing KPIs that match your business goals. Without these, it’s nearly impossible to gauge where you are let alone how you are going to measure your progress. b) Efficiency – Having technology, data and process all on the same path provides greater agility. We all talk about agility, but this translates into understanding which steps are preventing your marketing and sales teams’ from accomplishing tasks and projects faster. Does it take a month to launch an email campaign, when it could be done in the same day? Does your sales team spend too much time on a checklist of items with MQLs missing opportunities? c) Effectiveness – Ensuring your marketing technology and processes are all going in the right direction. With having the visibility under your belt, ROI becomes center stage. Build a rhythm with sales. Align your marketing technology with CRM. Attribute every marketing effort. Close the marketing loop. Now, you’re on your way to predicable revenue, asking and getting the approval for the appropriate budget for next year! d) Adaptable – Market conditions are always changing. Prospects, customers, competition, and even the tactics of your own organization are shifting simultaneously. The industrial age empowered with the previous three concepts, but it is adaptability which is necessary in the information/knowledge age. Over and over, the most successful marketing and sales organization strive for an adaptable operation (people, process, information and technology). Terms such as agile, predictive, learning are fast becoming new standards in optimizing marketing performance and increasing revenue at lower costs. e) Support – When working out, having someone help you push harder encourages greater progress. Have someone act as an advisor & champion for both the marketing and IT to develop sustainable marketing technology strategies. Ensure they can maximize your current resources, help you demonstrate value and help you justify the next investment with confidence. A good coach pushes you and your ecosystem to improve and adapt. Go! 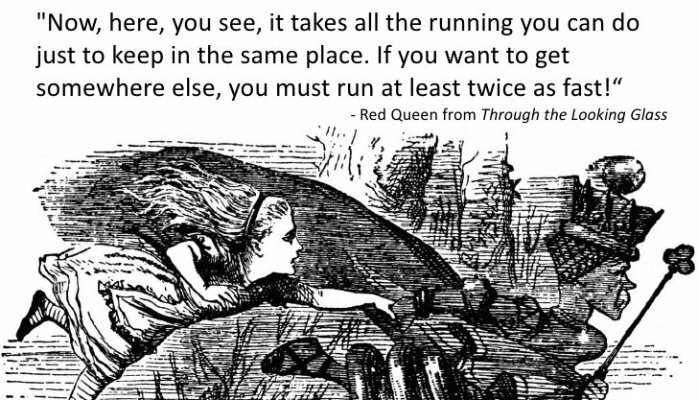 Transform your marketing efforts and overthrow the Red Queen.